We have now entered the second voting phase for the Artist Playing Card project! All members of ArtWanted are invited and encouraged to review the Fantasy/Sci-Fi artwork submitted for this project and vote on your favorites. First, visit the voting page for either the Fantasy or Sci-Fi artwork. You will be shown a random image and asked to rate that artwork from 1-5 stars (higher being better). If you wish, you can also type in an optional artwork comment for the artist while rating. After voting, you will be shown another image to vote on. You can vote for as many images as you like. To make things fair, we do not display the name of the artist during the voting process and we don't allow the artist to link directly to their image for voting. We don't want someone with 10,000 Instagram followers to send a voting links to their image to gain an unfair advantage. The voting will be random and based off talent and subject matter alone. Voting will be open on the Fantasy/Sci-Fi artwork for two weeks and will end on May 31st. 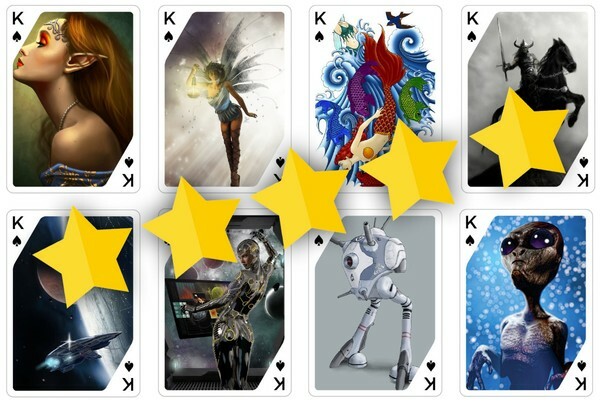 There will be 54 different artists chosen for this Fantasy/Sci-Fi deck. The artwork with the highest rating will be chosen to be included in the final product. If an artist has two images that qualify, only one of those images will be selected to allow additional artists to be included. We have seen some amazing artwork submitted for this project. We apologize that not all artists can be included in the final selection. We hope this project is a success and we can create many more decks and have more opportunities for artists to participate. Qualifying winners of this contest will be notified within the first few weeks of June. Those artists will need to confirm they want to participate in the playing card project. We will also ask these artists for additional information for the project and be required to sign a short artwork release statement. If there are artists that do not fill out all the required information, they will not be included with the project and we will allow other artists to participate, based on their artwork rating. Here is the link to get started and to rate the artwork that has been submitted for this project. Good luck to everyone! We are well past the June 15th mark, is this project delayed? Hmm Any new contests?? Like inktober or something.